On the eastern slopes of Dakota Ridge, Emma Judd prepares for takeoff! Even down at sea level and despite its name, the Sunshine Coast is no stranger to snow. Anyone who has grown up here can attest to cold snaps and snow days. 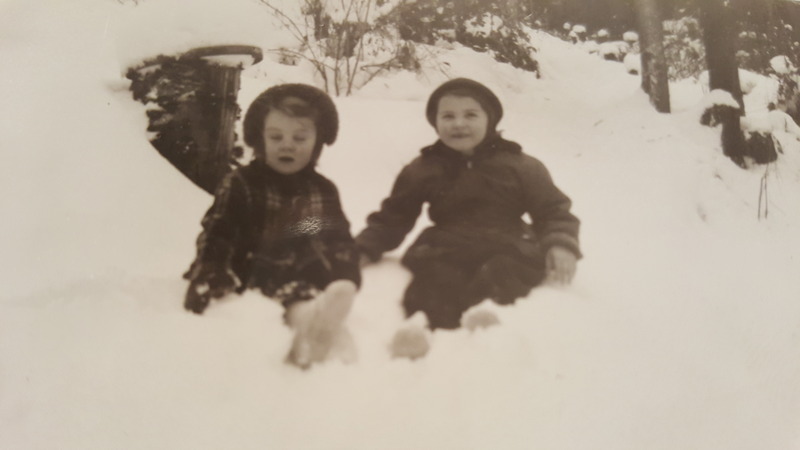 Despite claiming to be 29, my mum-in-law Mary Vandeberg recalls the winter of 1954 vividly. Trouble with a capital T, Mary Vandeberg with her sister Gail somewhere on a road near Davis Bay, circa 1954. For Mary’s daughter, my wife Leah, tobogganing the road down from Chatelech Secondary, was the ultimate way to celebrate a snow day. 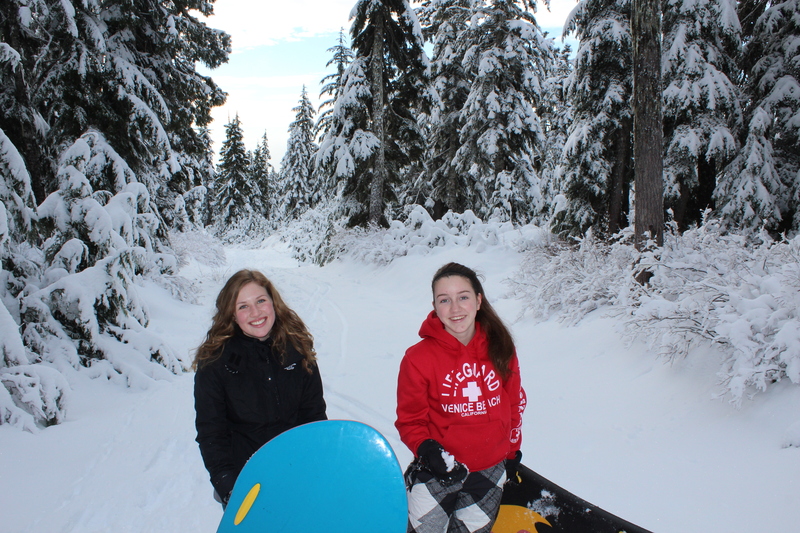 Even in the snowiest winters of recent years, it’s difficult to image tobogganing Highway 101 from Selma Park down to Davis Bay, as Mary describes. But that doesn’t mean there aren’t plenty of other popular places to slide. Located 14-km up the forest service road at the end of Field Road in Wilson Creek, Dakota Ridge is one of the few, if not the only sanctioned sliding area on the Sunshine Coast. Created in 2013, the sliding area has become a popular addition to the winter recreation venue, accounting for 30 percent of total traffic, according to the Sunshine Coast Regional District. Especially popular with young families, the groomed hill is right behind a Quonset warming hut, which is equipped with a wood stove and picnic tables. If you’re craving some off-piste thrills, there’s a long, gentle clearing off Balsam Loop on Dakota Ridge’s eastern slope that’s perfect for building bumps and jumps. We have liftoff! Ariana Harder takes to the skies above Dakota Ridge. Local Cavin Crawford, who’s helped plow access roads to Dakota Ridge and the Tetrahedron for years, recommends a 200-metre slope at the eight-kilometre mark of the forestry road, near the turnoff for Dakota Bowl. Winter tires and chains are essential, if you’re planning to drive to Dakota Ridge; or catch the scheduled shuttle with Wilson Creek-based Alpha Adventures. Closer to sea level, school fields are popular with the younger crowd. 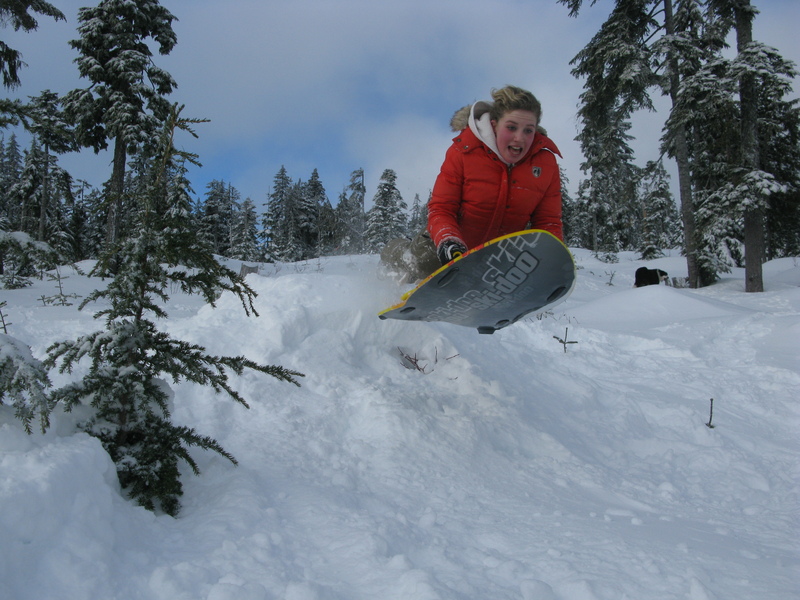 “The slope behind Gibsons elementary is good for younger kids and pretty good for building jumps,” says 12-year-old Kaishan Nonacowie. There’s also a gentle slope behind Elphinstone Secondary. Flume Beach Park at the junction of Flume Road and Beach Avenue in Roberts Creek might be the closest you’ll get to sledding on the shoreline. It was a favourite spot when my kids were growing up and offers the added advantage of a scenic picnic area, plus the option of building a beach fire to warm up by. In their element, Ariana Harder and Emma Judd on Dakota Ridge. A poll of friends and family on Facebook elicited numerous favourite spots and a theme quickly developed: roads seem to be where it’s at. Some short, some steep, and most dead-ends. (My son suggested School Road in Gibsons, which might have been feasible in 1917-18, but not 2017-18.) While there’s room for discretion on secluded roads in particularly heavy snowfalls, as a rule, cars and toboggans don’t mix, especially for emergency services, highway maintenance contractors, and stranded residents. Back in the 1970s, it was a different story, according to life-long Coast resident, Warren Hansen. “My favourite hill was Benner Road, in Selma Park,” recalls Warren. “Back then, there was no such things as immediate plowing. People had to park on the highway in Selma Park and walk up to their homes. For at least a couple of days, kids could slide down Benner Road, or the top of Snodgrass and Chartwell, or the top of Radcliffe Road. Every kid from miles around would converge on this location. 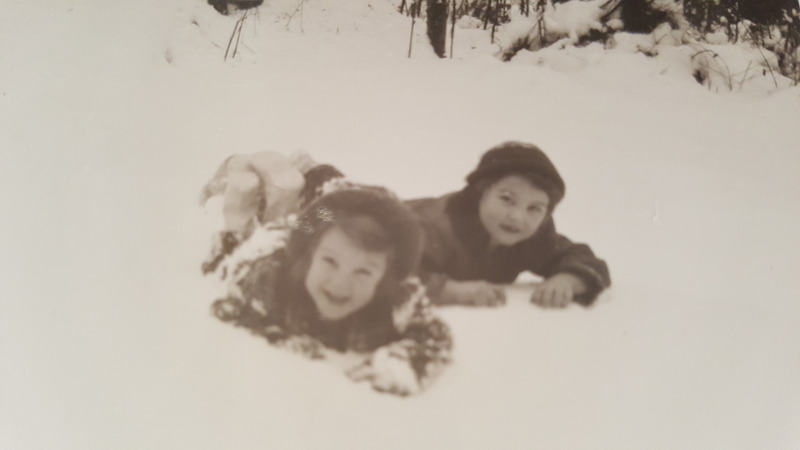 Mary Vandeberg and her sister Gail in the snowy Sunshine Coast winter of 1954. Hansen acknowledges those days are over, but has mixed feelings. Wherever you end up sliding this winter, keep a few precautions in mind. 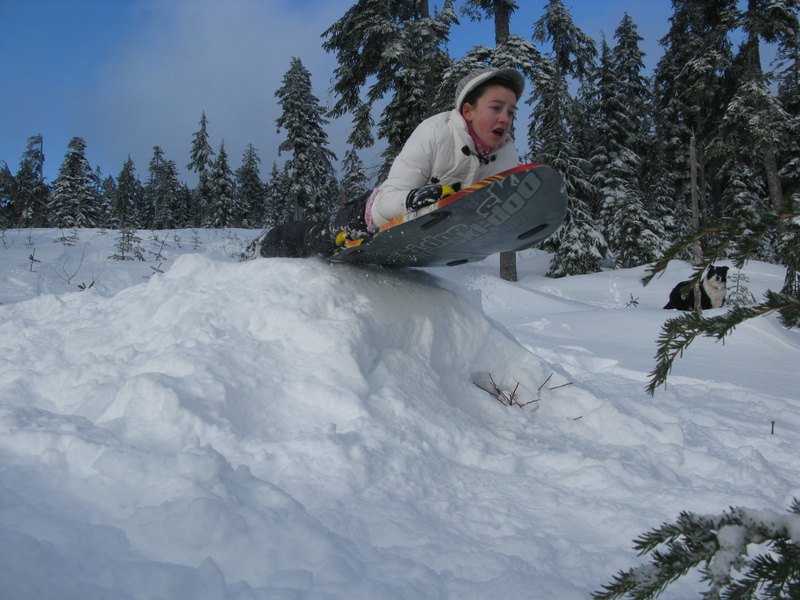 BC Children’s Hospital recommends that young ones wear a ski, hockey, or bike helmet for tobogganing. Make sure your kids know how to control their speed and stop properly. Choose a slope away from roads and free from obstacles, such as rocks, trees, and fences. Never ride on a sled that is being pulled by anything motorized. Bundle up, stay safe, and enjoy the snow!